DoCmd.RunSQL Method runs specified SQL statement. The SQL statement can only be action query (such as create table, modifying data), but not Select statement. SQLStatement A string expression that’s a valid SQL statement for an action query or a data-definition query. It uses an INSERT INTO, DELETE, SELECT…INTO, UPDATE, CREATE TABLE, ALTER TABLE, DROP TABLE, CREATE INDEX, or DROP INDEX statement. Include an IN clause if you want to access another database. UseTransaction Use True (–1) to include this query in a transaction. Use False (0) if you don’t want to use a transaction. If you leave this argument blank, the default (True) is assumed. DoCmd.SetWarnings False Method is used to disable the warning message. The below Select statement will cause Run-time error ‘2342’, because DoCmd.RunSQL Method only supports action query. 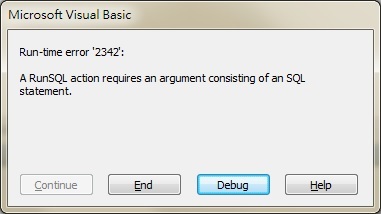 strSQL = "Select * FROM [Schedule_Table] WHERE [Empl ID]='001'"
The error message “Run-time error ‘2342’: A RunSQL action requires an argument consisting of SQL statement” is very confusing, it fails to point out the error is caused by using non-action query. The below code creates a Query called “tempQry” using CreateQueryDef Method and then open it using DoCmd.OpenQuery Method. Just in case “tempQry” already exists in database, DoCmd.DeleteObject Method deletes tempQry if it exists.